We are a financial services Company established jointly by Toyota Financial Services(TFS) of Japan, a wholly owned subsidiary of Toyota Motor Corporation of Japan and UMW Corporation Sdn Bhd. 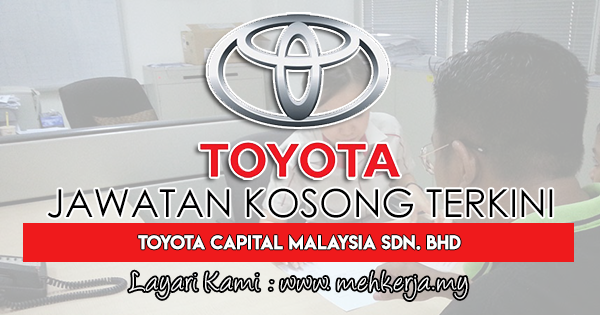 TOYOTA CAPITAL MALAYSIA Sdn Bhd is a subsidiary of Toyota Financial Service Corporation, which specializes in vehicle financing for Toyota Motor Corporation around the world. Jawatan Kosong Terkini 2018 di Toyota Capital Malaysia Sdn. Bhd. We are a financial services Company established jointly by Toyota Financial Services(TFS) of Japan, a wholly owned subsidiary of Toyota Motor Corporation of Japan and UMW Corporation Sdn Bhd. TOYOTA CAPITAL MALAYSIA Sdn Bhd is a subsidiary of Toyota Financial Service Corporation, which specializes in vehicle financing for Toyota Motor Corporation around the world. Toyota Financial Service (TFS) is represented in 34 countries worldwde, with managed assets totalling US$156.6 billion (as of 31 March 2012). Toyota Capital Malaysia's mission is to become the Most Admired Auto-Financier through service excellence and producat innovation in Malaysia. Our core business model is to provide automotive financial services ranging from individual & business vehicles as well as our new initiative, Fleet Management. 0 Response to "Jawatan Kosong Terkini di Toyota Capital Malaysia Sdn. Bhd - 3 Aug 2018"